I find the Sevres Porcelain history to be very interesting. In 1710 Augustus the Strong of Saxony with the help of his alchemist Bottger discovered the formula for hard paste porcelain in Germany, and the Meissen porcelain company was started. Meissen porcelain was considered a thing of beauty, and that is why they called it white gold. Augustus the Strong built the Japanese Palace in Germany and filled one floor with fabulous Meissen porcelain items. He gave many gifts of Meissen porcelain to the royalty in different countries, and thus the beautiful Meissen porcelain was coveted by the Royalty throughout the world.. In the early 18th century in France, many companies tried to imitate the beauty of the hard paste porcelain from the Meissen company, but with little success. In 1745, the company of Vincennes was started. One of Vincennes first items offered were porcelain flowers. Flowers like jonquils, tulips, narcissus, buttercups, lilies, violets and stocks were offered. Two ladies of royalty, Marie Leczinska and Marie Joseph, daughter of the elector of Saxony received a white vase that was over three feet tall with 480 porcelain flowers. The latter vase is now in the Dresden Museum. In 1752, King Louis the Fifteenth wanted the Vincennes company to move to Sevres. At this time,he bought one quarter of the shares of the company, so he could have the majority of the shares. The move to Sevres was very expensive resulting in the porcelain company having little or no money. King Louis the Fifteenth bought all the other shares back from the other shareholders in 1756, and from this time he became the full owner until the French Revolution. The company became the Manufacture Royale and from this day marked its ware with the Royal Monogram. 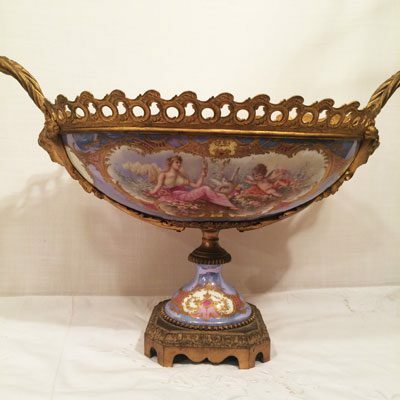 The Sevres Company searched for the finest painters, gilders and chemists to perfect the rich ground colors and the delicate gilding for which they are known. All formulas discovered at Sevres were strictly guarded, as the King forbade workers from leaving Sevres to work for other companies. Finally, in 1769, the Academie des Sciences proclaimed that Sevres had perfected the formula for hard paste porcelain. This was after beds of kaolin were found in the region of Limoges, and some of these quaries were bought for use by the Sevres Company. Thus, Sevres became one of the finest makers of porcelain. 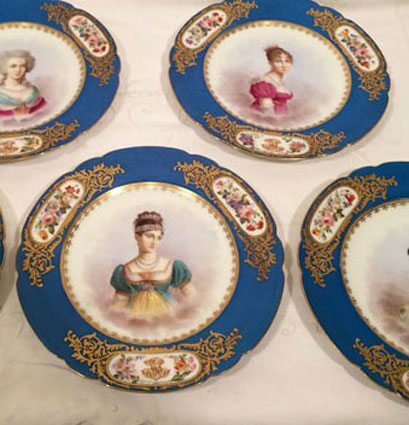 Sevres porcelain was coveted by the royalty around the world. Even now the extensive collection of George the Fourth at Buckingham Palace at the Queen's Gallery is one of the largest collections of antique Sevres Porcelain in the world. Sevres was known for their important pieces like large vases, jardinaires, pieces for table services and porcelain plaques for furniture. Every year the King would hold exhibitions at his apartment in Versailles showcasing the fabulous new pieces that were made at the Sevres Porcelain Company. At these exhibitions, Royalty from all over the world would have a chance to purchase rare pieces of Sevres porcelain. Success at the Sevres Porcelain Manufactury continued until right before the French Revolution.. At this time, wealthy French people hesitated to buy delicate expensive items like fine porcelain. Louis the Fifteenth was succeeded by Louis the Sixteenth. He and his wife, Marie Antoinette, took the throne from 1774 to 1792. In 1789, the Bastille was attacked and riots broke out in France starting the French Revolution. Louis the Sixteenth was executed as a result of the French Revolution. The French Republic was started in 1792. The Royal Monogram on Sevres Porcelain was replaced by the initials R.F. and Sevres. In 1800, Lucien Bonaparte appointed Brogniart to save the Sevres Porcelain Maufactory, and to restore its importance. Brogniart brought special painters to the Sevres Porcelain Company like the famous Fragonard. He wanted Sevres to stand for purity, elegance and technical quality. Napoleon also loved Sevres Porcelain and his wife Josephine had many pieces in her collection. After the fall of Napoleon in 1815, Louis the Eighteenth was reinstated to the throne. At this time, Sevres Porcelain was still loved by royalty. Large porcelain plaques were being made which were copies of famous paintings. These were exhibited at the Louve annually. In 1824 Charles the Tenth acceded to the throne until 1830 when he was forced to abdicate. Louis Phillippe took the throne in 1830 and in 1848 he was forced to abdicate when he was exiled to England. In 1847, Brogniart,director of Sevres Porcelain died. In 1848, another revolution occurred in France with the establishment of the second Republic when Napoleon the third, Napoleon's nephew and heir, became President. He reigned from 1852-1870. In 1848, Salvetal became director of Sevres Porcelain Manufactory, and for thirty-five years under his technical direction Sevres was very productive. They developed painted enamels, produced faience and glazed earthenware and made vases and centerpieces fit for imperial castles. Many of the porcelain objects were two pieces that were put together and some had gilt bronze decoration. During the Second Republic, Empress Eugenie, Napoleon the Third's wife, brought back the love of the 18th century styles, and thus Sevres continued its success. 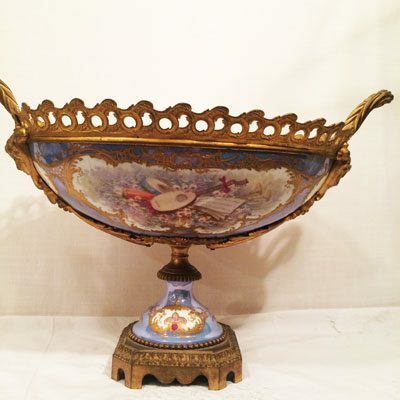 In the 1880s, Albert Carrier Belleuse became director of Sevres Porcelain. At this time, two new processes were done at Sevres: paste on paste and the painting of bisquit figurines. In 1897, Sandier became Director of Sevres Porcelain. 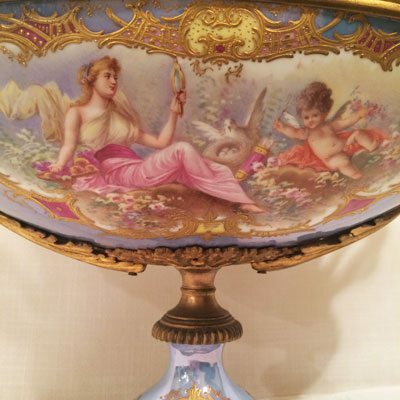 Now that you understand the history of Sevres Porcelain, you can see why Sevres Porcelain was considered one of the best porcelain companies in the world in the 18th and 19th centuries.